The Island Vibe backpackers in Jeffrey's Bay is located atop a sand dune, just a few minutes walk to a popular wave called Kitchen's Window, the Billabong factory shop, and the downtown area. The decor and atmosphere revolves around surfing, with the dedicated waking up as early as 5am to check the weather and hit the water. 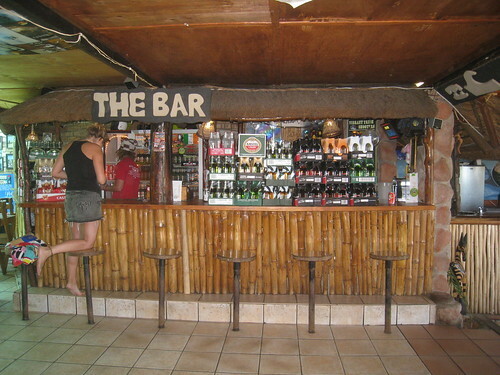 The motivation of some was all the more surprising as the bar was busy every night. My participation did little to help me get over a developing cough and cold. For two weeks each July, the world's best surfers descend upon Jeffrey's Bay for a Billabong contest held at Supertubes, the big wave in town. I took a taxi up there to catch a glimpse of it, even though the wind was keeping the surfers away. Hearing surfers talk, I'm sure there is a proper way to describe it, but you're stuck with the words of a layman. Aside from a few wooden observation benches, there is nothing special on or around the narrow strip of beach. In fact, there is a rocky outcropping between the beach and the wave, which looked unforgiving. The waves are much bigger in winter (the northern hemisphere's summer), yet I could clearly see and capture the tubular nature of them (dude). For the non-surfing visitors, Jeffrey's Bay offers great shopping opportunities. Prices for name-brand clothes were so cheap, I completed another wardrobe overhaul at the expense of my Kho San Road threads. Aside from the regular surf shops, Quicksilver and Billabong have factory shops where you can sort through tons of clothes. For example, I bought a black Billabong hoodie for $20. It was a ” sample”? meaning it didn't go into full production, and is therefore something of a limited edition (I like to think), and on sale for 25% off! T-shirts were as low as $7. I couldn't resist a pair of Volcom board shorts at a surf shop for half the price they would cost in the USA. To the potential disappoint of a former coworker, I'm officially retiring the Def Leppard'esque brown and orange Andy Irons shorts I bought on sale in Byron Bay, Australia back in January. awesome shopping deal! i’m very jealous seeing as when i try to shop for surfing clothes here in the US even sometimes in Puerto Rico, the prices are outrageous. good for you though, hope you’re enjoying the weather! Jbay is a 40minute drive from my town. We go to Jeffreys Bay for 2 reasons… to surf or to buy cheap Billabong clothing at the factory shop there. On New Years eve hundreds of us ,young people, go to Jbay to do the count down on the beach and party into the next year. 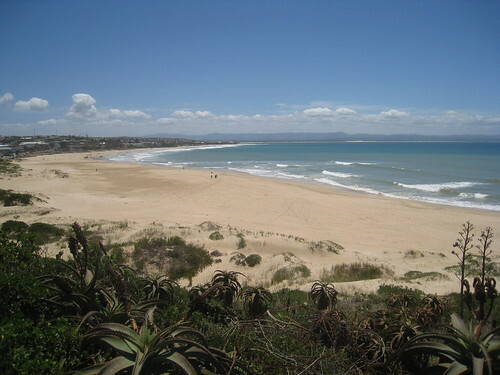 I love Jeffreys Bay!!!! I am sooooooooo super proud to call this my home town! !